Of course I cross my fingers for your print. Same as you had done for mine. First I slice it with the B9C slicer at 101.6 µm (max. possible thickness). Then I see how many slices really were made. This number is multiplied by the (preset) layer thickness of the WIZARD1 (105 µm). Result: The final hight. By MeshLab I measure the sizes of the object (proportions). The same ratio is now important for my WIZARD1. Means I have to adjust the width of the intended print by vertically shifting the projector (coarse steps). Fine tuning is done by the zoom lens. My mistake was when I measured the hight of the bust that I measured from a wrong plane. I mixed up the waist of David with the plane where the first slice was done, just at the level of the left elbow. I do hope to do this part correct for the next print, but I am quite sure then I will do something else wrong. Now I substituted the monochrome cam by my higher resolution digital photo cam. See the (blue) result. Central green and blue illumination of the red plastic. No shadowing. ... I'm thinking, it's the 'pixelation' of the slices - Walter, you can try with antialiazing the images, so the horizontal pixel-steps will be smoothed away. The vertical steps can only be reduced by lower layer-height or 'blurring' through adding more opacity to the resin. 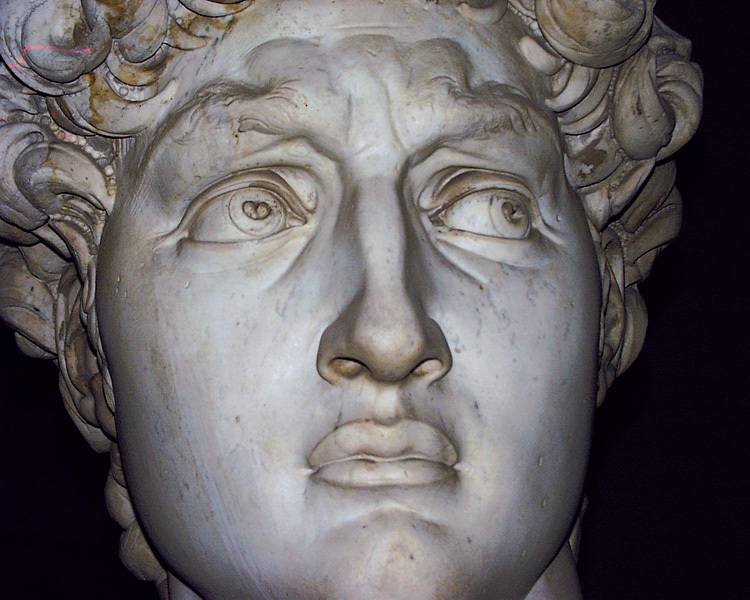 Now the David bust is without its supports. They were easy to remove, I had learned the handling by the DAVID angel. @ Victor: The „Moiré“ on the blue image above, specially on the left hand and the breast are very fine contour lines, only visible under special conditions. Normaly not without a magnifying glass. I don't know why they are so magnified to see under green and blue LED illumination. But in future I will try to reduce them by using a higher resolution for the slicing. At present it was set to 1024x768. In future I will set it to 1920x1080, this would correspond with the native resolution of my projector. The hollowed out 206 mm David statue successfully printed in one piece! The "liquid David" has become solid. You can see the 206 mm statue in full size and in all of David's perfect beauty. I mean Michelangelo's great work! The print consists of 1967 layers á 105 µm. The weight of the hollow statue is 73 grams. So the material costs are 8.66 € (incl. shipping and customs duty). About 5% should be added for supports. Scan and print. Latter with green and blue LED illumination. 'PacManFan' on RepRap forums is developing another slicer, that generates bitmaps for UV-DLP-printing and user configurable G-Code for the stage. Here we have the „Melancholy“. Before printing it was hollowed out and also a bit modified by Mattia. Latter means the flowers of her stole were substituted by „simple“ cloth. So it was easier to print. Let's hope that Rinaldo Carnielo will forgive us when he looks down from heaven. The print consists of 910 layers á 105 µm. Projector resolution was set to 1366 x 768 pixels. In the post above you mentioned a new slicer software. But at present I am very satisfied with the B9C slicer of Michael Joyce. It works fine. Thanks again to Mike for his great work and for the possibility to let it available for everyone for free. Very nice! Glad to hear our slicer is working well for you too. The eagle is landed in our garden. Wonderful! Now the eagle can fly, free! p.s. : I see that some small lines are visible... do you think this is related to the Z axis movement or to the "vacuum effect" of the resin? Mattia, thanks for the compliments. Yes, the surface of the eagle isn't as smooth as the skin of the Melancholy above. I think the horizontal lines are due to a becoming worse PDMS coating on the vat's bottom. Sliding of the just printed layer over the surface wasn't as perfect as it should. The coating must be renewed. Also some other parameters were changed: This time I have used a higher resolution of 1280 x 1024 for slicing and 1920 x 1080 for printing. Of course the higher resolutions cannot be the reason why. Unfortunately it's difficult to see such lack during printing. I am still in a learning process. Now you know who is under the helmet of Iron Man, it's me! The hollowed print was made by 743 layers, so its height is 78 mm. Resolution for slicing was 1280x1024 and for printing 1920x1080. The original surface (from GrabCad) of the armour looks like polished. But I reduced a bit its mesh density, so it got a fine structure. For this print no supports were necessary to build. In the meantime the eagle has become a bald eagle [Haliaeetus leucocephalus]. Thank you Johanna for colorization. Great job!